Most people think of Lobster Bisque as a high calorie decadent creamy soup. 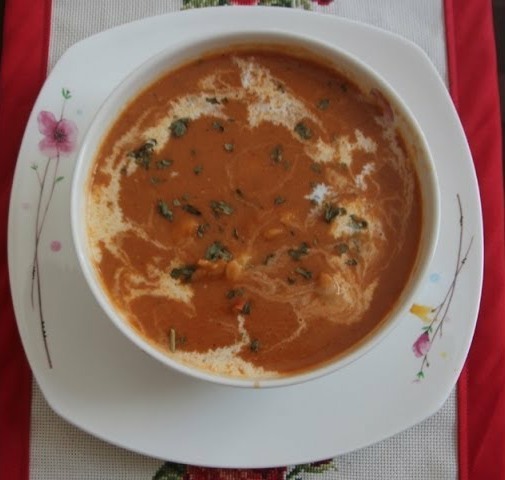 Lobster Bisque Recipe is lighter and healthier than most recipe you will find. 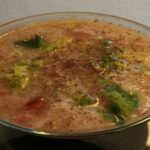 In classic French cooking Bisques are often thickened with rice. Most individuals assume Lobster Bisque is a cream based soup. My recipe is made by cooking a seasoned Seafood stock and then flavoring it with a Mirepoix ;2 Red Onions, 3 Stalks of Celery, and 4 Carrots. When these vegetables are cooked flour and butter are add to create a roux. The seafood stock is added along with Tomatoes to give the Lobster Bisque it designative color. Only a small amount of butter and cream are used and this recipe has about half the calories of your conventional Lobster Bisque recipe. On the upside this recipe is chuck full of sweat Lobster Meat. This is The Bald Chef’s recipe for homemade Lobster Bisque. In a Large Stock pot bring 2 1/2 Cups Seafood Stock, and 2 Cups Water of water to a boil. Cut your Lobster Tails down the underbelly and add to the boiling water. Cut up your Mirepoix ;2 Red Onions, 3 Stalks of Celery, and 4 Carrots. after the lobster tails have cooked for 5 minutes remove from the boiling water and set aside to cool. Remove the Lobster Meat from the shell and return the Lobster Shells to the stock pot. Add ,1 Tabelsoon Salt, 2 Tablesoons Black Pepper to the boiling stock. My friend made this for a dinner party and it was the best I have ever had…going to try making this myself! I will definitely give this one a try.Â Your technique for making Lobster Bisque is quite easy! Gonna try to make this recipe this weekend. Will let u know how it turns out. Where in dc area are u getting ur lobster tails? I’m in the area too. Was thinking H mart. “It’s freaking freezing here too. Â I could sure use some soup. Wow Chef Glen that’s looks so delicious, gonna add to my favorites and try it soon. Can I do it with shrimp or crawfish? This is one of our favorites! Mine is really close to yours. You made me so hungry!!! Great recipe once again! that looks so good, i’m going to make that.